In an earlier column we argued that today's local elections have an impact on the legislative and presidential elections that are scheduled for mid-2019. Firstly, the outcome of the local elections are believed to influence the choice of vice-presidential candidate. Only two presidential candidates are assumed to participate in the 2019 presidential election: incumbent President Joko Widodo and former army general Prabowo Subianto. It remains unclear who both men will pick as their vice-presidential candidates. Selecting a vice-presidential candidate that does well in a specific key province where the battle between Widodo and Subianto is close (based on the latest opinion polls or 2014 election result), could make the difference in the battle. Or, if a political party sees many of its candidates winning in the local elections, then it has strong bargaining power to request for a vice-presidential candidate from its inner circle. For example, based on the quick count results, Golkar-backed candidates won in nine of the 17 gubernatorial elections. This would give Golkar some ammunition to request Widodo (Golkar has already announced Widodo its presidential candidate) to select, for example, Golkar Chairman Airlangga Hartarto as his vice-presidential candidate in the 2019 election. Secondly, considering Java is the most populous island, the local election results on Java are seen as proxy battles between Widodo and Subianto for the 2019 election. Governors who win the 2018 local elections are also in a position to influence the electorate in their respective provinces. Below we present the quick count results in the four most populous provinces. The official results are expected to be released by the General Elections Commission (KPU) in mid-July 2018. In conclusion we can say that - looking at the quick count results on Java in relation to the 2019 presidential election - the battle between Widodo and Subianto is expected to become very tight and there seems to be strong growth in votes for Gerindra-backed leaders in the quick count results (compared to previous elections and compared to the latest opinion polls prior to the election). However, with Widodo expected to win most of the votes outside Java, we would at this point still place our bets on Widodo. Still, over the past year it has proved successful for conservative Muslims and parties like Gerindra to play the "SARA card" (referring to issues related to ethnicity, religion, and race) as well as hate speech to influence and scare people. They are expected to continue with that strategy - possibly even making more use of that strategy - as we approach next year's elections because it proved a strong vote gainer. Thus, we do not agree with various publications in international media (including Bloomberg and Reuters) that claim the unofficial counts put Widodo in a stronger position to win the 2019 presidential election. In our view, the results actually point at a tighter-than-initially-assumed battle next year. Ridwan Kamil, who decided not to run for a second term as Mayor of Bandung in order to pursue victory in the West Java gubernatorial election, is in pole position according to the Litbang Kompas quick count result. After all data had come in, the reformist Bandung Mayor enjoyed a lead over former army general Sudrajat and West Java Vice Governor Deddy Mizwar. The candidate that was nominated by Widodo's PDI-P party, TB Hasanuddin, did not do well in this race. Meanwhile, Gerindra's Sudrajat may not have won but proved much more popular than earlier opinions polls had indicated. Therefore, we can conclude that it will become very difficult for Widodo to win the battle in West Java next year (after all West Java is home-ground to the Islam-based PKS; a party that is likely to back Subianto and also seems to mastermind a social media campaign aimed at changing the president in 2019). However, in local media we read that Kamil is much closer to the Widodo camp than to the Subianto camp. This could therefore be a disadvantage for Subianto. 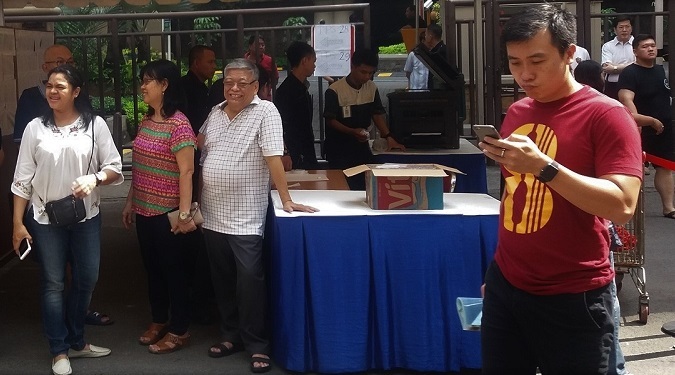 It was a big surprise to see Gerindra-backed Sudrajat taking almost 30 percent of the votes (earlier opinion polls estimated his support at around 5-10 percent). This sudden jump could be caused by the latest debate round when the Sudrajat team suddenly showed a t-shirt with the words "change the president in 2019" (part of the social media campaign). Those voters who are anti-Widodo are assumed to have then shifted to Sudrajat. Incumbent Central Java Governor Ganjar Pranowo (supported by PDI-P) is well positioned to be selected for a second five-year term. He enjoys a comfortable lead over former Energy and Mineral Resources minister Sudirman Said (supported by Gerindra) based on the quick count result. However, the gap between the PDI-P backed candidate and the Gerindra-backed candidate was much closer than had initially been forecast, implying that the battle for the 2019 presidency will also be narrower than before. Still, Widodo, who originates from Central Java, should be able to win in this province in the 2019 election. After failed attempts in 2008 and 2013, former social affairs minister Khofifah Indar Parawansa seems on track to become the new governor of the East Java province. Based on the quick count result she beat Saifullah Yusuf (also known as) Gus Ipul by a comfortable margin. Khofifah Indar Parawansa has already confirmed her support for Widodo in the 2019 presidential elections. Former army general Edy Rahmayadi, supported by Gerindra (and Golkar), enjoys a big lead in the battle for North Sumatra according to the quick count result. PDI-P's Djarot Saiful Hidayat is at a far distance. As such, Subianto seems to be in pole position for North Sumatra in the 2019 presidential election. Also in the 2014 election Subianto had won (albeit narrowly) over Widodo in this province. Earlier this month it was reported in Indonesian media that Rahmayadi lied about having undertaken the umrah (the "small" Islamic pilgrimage) in May 2018. Reportedly he was in Malaysia to be treated for a heart condition. However, to avoid his fitness (for North Sumatra Governorship) being questioned, he allegedly pretended to undertake the umrah.